Why should I buy this product? I don’t want to hear that I can do this or that and this and that. I don’t want to know that I can run in place with a $300 purchase as most know that running in place can be done without a lot of expense. For the kettlebell, I think it is the Swing, Goblet Squat and the TGU. For the barbell, the deadlift and the whole family of presses. In my backyard, I have a beautiful climbing rope and a set of rings. This book, Rings of Power, answers that question. Mike Gillette has made a career of learning and relearning the simple key to understanding everything in the weightroom. And, the answer is this: Rings are a tool. Rings are a tool to build strength. Rings can fill the gap in training for areas like vertical and horizontal pulling and the need to build the abdominal wall and the Anterior Chain. Look, I love my ten-dollar ab wheel, but where do we progress from there? I constantly moan and complain about my athletes doing too many Bench Presses and too many Push Ups. God Bless Them for working out and a round of drinks for the whole house, but we have got to get them working in the opposite direction. How? Rings of Power is a strength book. Rings of Power focuses on some big challenges, like the Inverted Ring Push Up, but provides detailed regressions and corrections for those who might not be able to leap up on day one and pound out the repetitions. It’s a principle-first book. Mike’s point about the value of rings for most adults doing Pull Ups is spot on. For years, we have joked about MAPS, Middle Age Pull Up Syndrome. This simple, but elegant, solution can provide comfort for those who understand the need for Vertical Pulling, but can’t stomach the pain of the screaming elbow. 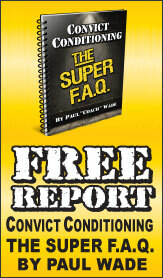 The chapter on Trunk Extension will answer all your questions concerning "what is your core?" Many approach rings, and all pieces of gymnastics equipment, like it is only fitting for Olympic gymnasts. Mike is talking to the masses, the common man or woman who wants to be stronger and has an interest in playing with load. Your body and gravity are the load. The shaking straps will make you reconsider what you thought of as stability. In addition to principles and the basic skills you will learn, this book is also filled with very simple-to-understand photographs. Investing in rings is very inexpensive but the payoff is amazing. Of course, finally, I must say that a bad joke has been choking me throughout both reading the book and writing the foreword: Mike’s work will indeed make you "Lord of the Rings." Thankfully, I am done with this attempt at humor. And, a final warning: you will find yourself wanting to run and leap up on the rings. I would suggest listening to Mike and taking some baby steps up the levels of intensity and expertise. Your enthusiasm is admirable, but take your time in progression. Enjoy. Enjoy this book and the process of relearning how to have fun while building strength.